A musical instrument is a device constructed or modified for the purpose of making music. In principle, anything that produces sound can serve as a musical instrument, including the human voice. The term, however, is generally reserved for items that have a specific musical purpose. The academic study of musical instruments is called organology. Human history and archaeology show that a basic urge to express emotion though music has existed since prehistoric times. Though the human voice is likely to have been the first means used to realize a musical idea in concrete form, virtually all human cultures eventually created musical instruments as a way to create greater variety in musical expression. In the ancient cultures of China, Africa, Greece, the Americas, Egypt and India there existed a tradition of developing musical instruments for a variety of purposes, including dance, religious rituals, entertainment, and even healing. Various systems have evolved for classifying musical instruments. Among the types of often distinguished are: string instruments, woodwind instruments, brass instruments percussion instruments, keyboard instruments, idiophones, lamellophones, and friction instruments. Researchers have discovered various archaeological and anthropological evidence of musical instruments in many parts of the world. Some finds date to 67,000 years ago, although their status as musical instruments is disputed. Artifacts dated back to around 37,000 B.C.E. have been clearly identified as instruments created by humans for the purpose of making music. In July 1995, Slovenian archaeologist Ivan Turk discovered a Neanderthal bone carving in the northwest region of Slovenia. 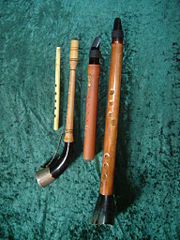 Known as the Divje Babe flute, it features four holes that could have been used to play four notes of a diatonic scale. Researchers estimate the flute's age to be between 43,400 and 67,000 years, making it the oldest known musical instrument and the only musical instrument associated with the Neanderthal culture. However, some archaeologists question the flute's status as a musical instrument. German archaeologists have found mammoth bone and swan bone flutes dating back to 30,000 to 37,000 years old in the Swabian Alb. The flutes were made in the Upper Paleolithic age, and are more commonly accepted as being the oldest artifacts known with a fair amount of certainty to be musical instruments. The exact chronology of musical instruments across cultures is difficult to determine. Comparing and organizing instruments based on their complexity can be misleading, since advancements in musical instruments have sometimes reduced complexity. For example, construction of early slit drums involved felling and hollowing out large trees, but later slit drums were made by opening bamboo stalks, a much simpler task. It is likewise misleading to arrange the development of musical instruments by workmanship since culture advancement varies and societies have access to different materials. Ordering instruments by geography is also partially unreliable, due to difficulties in determining when and how cultures contacted one another and shared knowledge. German musicologist Curt Sachs, one of the most prominent musicologists in modern times, proposed that a geographical chronology is preferable, however, due to its limited subjectivity. Two Aztec slit drums, called teponaztli. The characteristic "H" slits can be seen on the top of the drum in the foreground. Until the nineteenth century C.E., written music histories often began with mythological accounts of how musical instruments were invented. Such accounts included the biblical Jubal (Genesis 4:21), a descendant of Cain and "father of all such as handle the harp and the organ;" the shepherd god Pan, inventor of the pan pipes; and Mercury, who is said to have made a dried tortoise shell into the first lyre. Modern histories have replaced mythology with anthropology. Scholars agree that there was no known single "invention" of the musical instrument or music in general. Drumming on hollow logs or using naturally-occurring items as whistles may have existed before "human" beings even evolved. A Homo habilis beating two sticks together in rhythm or even slapping his body could also constitute as a musical instrument. Moreover, inasmuch as the human voice is considered a musical instrument, the advent of chants or songs may also constitute another such "invention." Among the first devices external to the human body considered to be instruments are rattles, stampers, and various drums. These earliest instruments probably evolved due to the human impulse to embellish primitive chants and dancing. Eventually, some cultures assigned ritual functions to their musical instruments. From these beginnings came more complex percussion instruments, as well as such innovations as primitive whistles, flutes, and trumpets. Among early cultures that are known to have developed drumming rituals are the Chukchi people of the Russian Far East, the indigenous people of Melanesia, and many cultures of East Africa. Humans eventually developed the concept of using musical instruments for producing a melody. An early form of melody was produced by pounding two tubes of slightly different sizes. Such instrument pairs also included bullroarers, slit drums, shell trumpets, and skin drums. Cultures that used these instrument pairs often associated genders with them; the "father" was the bigger or more energetic instrument, while the "mother" was the smaller or duller instrument. 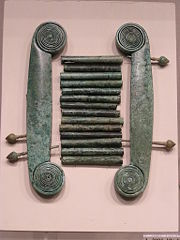 Musical instruments existed in this form for thousands of years before patterns of three or more tones would evolve in the form of the earliest xylophones. Xylophones originated in the mainland and archipelago of Southeast Asia, eventually spreading to Africa, the Americas, and Europe. Along with xylophones, which ranged from simple sets of three "leg bars" to carefully-tuned sets of parallel bars, various cultures developed instruments such as the ground harp, ground zither, musical bow, and jaw harp. Images of musical instruments begin to appear in Mesopotamian artifacts in 2800 B.C.E. or earlier. An particularly important find of actual instruments was discovered in excavations at the royal cemetery in the Sumerian city of Ur in the 1920s. These include nine lyres, two harps, a silver double flute, sistra, and cymbals. The graves to which these instruments were related have been carbon dated to between 2600 and 2500 B.C.E. A cuneiform tablet from Nippur in Mesopotamia dated to 2000 B.C.E. indicates the names of strings on the lyre and represents the earliest known example of music notation. By 2000 B.C.E., Sumerian and Babylonian cultures began delineating two distinct classes of musical instruments due to division of labor and the evolving class system. Popular instruments, simple and playable by anyone, evolved differently from professional instruments, often associated with temples, whose development focused on effectiveness and skill. Only a few musical instruments have been recovered in Mesopotamia, however. Scholars have relied largely on related artifacts and cuneiform texts written in Sumerian or Akkadian to reconstruct the early history of musical instruments in Mesopotamia. Historians have been able to distinguish six idiophones used widely in early Mesopotamia: Concussion clubs, clappers, sistra, bells, cymbals, and rattles. The sistra are of particular interest because similar designs have been found in far-reaching places such as Tbilisi, Georgia and among the Native American Yaqui tribe. Although stringed instruments, usually made of wood, tend not to survive as long as those made of more durable materials, the people of Mesopotamia preferred stringed instruments to any other, as evidenced by their proliferation in Mesopotamian figurines, plaques, and seals. Innumerable varieties of harps are depicted, as well as lyres and lutes, the forerunner of modern stringed instruments such as the violin. 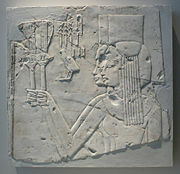 Two Egyptian princesses with sistra. Musical instruments used by the Egyptian culture before 2700 B.C.E. bore striking similarity to those of Mesopotamia, leading historians to conclude that the civilizations must have been in contact with one another. Sachs notes that Egypt did not possess any instruments that the Sumerian culture did not also possess. Moreover, the lyre, a prominent ceremonial instrument in Sumer, did not appear in Egypt for another 800 years. Clappers and concussion sticks appear on Egyptian vases as early as 3000 B.C.E. The civilization also made use of sistra, vertical flutes, double clarinets, arched and angular harps, and various drums. Little history is available in the period between 2700 B.C.E. and 1500 B.C.E., due in part to destruction resulting from wars. When the pharaohs of Egypt conquered Southwest Asia in around 1500 B.C.E., the cultural ties to Mesopotamia were renewed and Egypt's musical instruments reflected heavy influence from Asiatic cultures. Under these cultural influences, the people of the New Kingdom began using oboes, trumpets, lyres, lutes, castanets, and cymbals. In contrast with Mesopotamia and Egypt, professional musicians do not seem to have existed in Israel between 2000 and 1000 B.C.E., but were clearly present once the Temple of Jerusalem had been established. The Hebrew texts mention two prominent instruments associated with Jubal, given in Hebrew as "ugabs" and kinnors. These may be translated as pan pipes and lyres, respectively. Other instruments of the period included tofs, or frame drums, small bells or jingles called pa'amon, shofars, and the trumpet-like hasosra. King David, of course, was earlier known as a harpist ("kinnor" in Hebrew) in the court of King Saul. The introduction of a monarchy in Israel during the eleventh century B.C.E. produced the first professional musicians and with them a drastic increase in the number and variety of musical instruments. However, identifying and classifying the instruments remains a challenge due to the lack of artistic depictions. In Greece, Rome, and Etruria, the use and development of musical instruments stood in stark contrast to those cultures' achievements in architecture and sculpture. The instruments of the time were simple and virtually all of them were imported from other cultures. Lyres were the principal instrument, as musicians used them to honor the gods. Other instruments in common use in the region included vertical harps derived from those of the Orient, lutes of Egyptian design, various pipes and organs, and clappers, which were played primarily by women. Evidence of musical instruments in use by early civilizations of India is almost completely lacking, making it impossible to reliably attribute instruments to the Munda and Dravidian language-speaking cultures that first settled the area. Rather, the history of musical instruments in the area begins with the Indus Valley Civilization that emerged around 3000 B.C.E. Various rattles and whistles found among excavated artifacts are the only physical evidence of musical instruments. A clay statuette indicates the use of drums, and examination of the Indus script has also revealed representations of vertical arched harps identical in design to those depicted in Sumerian artifacts. This discovery is among many indications that the Indus Valley and Sumerian cultures maintained cultural contact. Subsequent developments in musical instruments in India occurred with the Rigveda, or religious hymns. These songs used various drums, shell trumpets, harps, and flutes. Other prominent instruments in use during the early centuries of the Common Era were the snake charmer's double clarinet, bagpipes, barrel drums, cross flutes, and short lutes. In all, India had no unique musical instruments until the Middle Ages. Musical instruments such as zithers appear in Chinese literature written around 1100 B.C.E. and earlier. Early Chinese philosophers such as Confucius (551–479 B.C.E. ), Mencius (372–289 B.C.E. ), and Laozi shaped the development of musical instruments in China, adopting an attitude toward music similar to that of the Greeks. 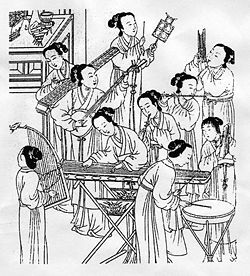 The Chinese believed that music was an essential part of character and community, and developed a unique system of classifying their musical instruments according to their material makeup. 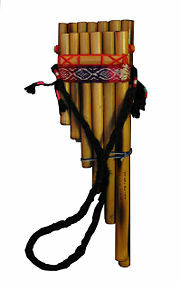 Idiophones were extremely important in Chinese music, hence the majority of early instruments were idiophones. 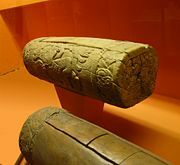 Poetry of the Shang Dynasty mentions bells, chimes, drums, and globular flutes carved from bone, the latter of which has been excavated and preserved by archaeologists. 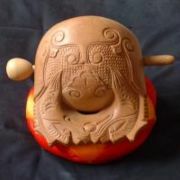 The Zhou Dynasty introduced percussion instruments such as clappers, troughs, wooden fish, and yu. Wind instruments such as flute, pan-pipes, pitch-pipes, and mouth organs also appeared in this time period. The short lute, a pear-shaped form of a western instrument that spread through many cultures, came into use in China during the Han Dynasty. Although civilizations in Central America attained a relatively high level of sophistication by the eleventh century C.E., they lagged behind other civilizations in the development of musical instruments. For example, they had no stringed instruments; all of their instruments were idiophones, drums, and wind instruments such as flutes and trumpets. Of these, only the flute was capable of producing a melody. In contrast, pre-Columbian South American civilizations in areas such as modern-day Peru, Colombia, Ecuador, Bolivia, and Chile were less advanced culturally but more advanced musically. South American cultures of the time used pan-pipes as well as varieties of flutes, idiophones, drums, and shell or wood trumpets. Traditional African instruments, such as the Nyanga pan pipes, Xhosa Uhadi bows, Kudu horns and the Akadinda can be found in many African cultures. 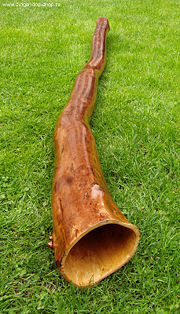 Clapsticks are found in Australian Aborigine cultures along with the traditional didgeridoo and gumleafs. A modern glass armonica built using Benjamin Franklin's design. There are many methods of classifying musical instruments. All methods examine some combination of the physical properties of the instrument, how music is performed on the instrument, how sound is produced, the range of the instrument, and the instrument's place in an orchestra or other ensemble. String instruments generate a sound when the string is plucked, strummed, slapped, etc. The frequency of the wave generated (and therefore the note produced) usually depends on the length of the vibrating portion of the string, its linear density (mass per unit length of string), the tension of each string and the point at which the string is excited; the tone quality varies with the construction of the resonating cavity. Examples: Guitars, violins, and sitars. Electric string instruments, such as the electric guitar, generate sound by a pickup placed under strings, which transfers a signal to an amplifier and can also be altered through special electronic effects. Woodwind instruments produce sound when the player blows air against an edge of, or opening in, the instrument, causing the air to vibrate within a resonator. Most commonly, the player blows against a thin piece of wood called a reed. Most of these instruments were originally made of wood, but some, such as the saxophone and some flutes, are now commonly made of other materials such as metal or plastic. Brass instruments produce tones by the vibration of the lips as the player blows into a tubular resonator. There are two factors in changing the pitch on a valved brass instrument: pressing the valves to change the length of the tubing, and changing the player's lip aperture or "embouchure," which determines the frequency of the vibration into the instrument. Brass instruments are normally defined by the way the sound is made, not by whether the instrument is actually made of brass. Thus, some "brass instruments" are actually made of wood—such as the alphorn and the cornett—while some woodwind instruments are made of brass, like the saxophone. The modern classification of brass instruments usually defines two basic types: Pylindrical (french horns, tubas, euphoniums) and conical (trumpets, cornets, flugelhorns, trombones). Percussion instruments create sound by being struck. In the percussion category there are two basic groupings: instruments of indefinite pitch (snare drum, cymbals, tambourine) and instruments of definite pitch (timpani, chimes, xylophone, marimba, glockenspiel). The shape and material of the part of the instrument to be struck and the shape of the resonating cavity, if any, determine the sound of the instrument. Examples of this include drums, bells and cymbals. Keyboard instruments are any instruments that are played with a musical keyboard by which each key generates one or more sounds. Many keyboard instruments have extra means (pedals for a piano, stops for an organ) to manipulate these sounds. They may produce sound by wind being fanned (organ) or pumped (accordion), strings either hammered (piano) or plucked (harpsichord), or by electronic means (synthesizer). Idiophones and Lamellophones create a sound by the plucking or striking of a thin, plate-like structures made from different materials (metal, wood, bone, and so on). Idiophones include such instruments as the jew's harp. Sometimes classified as idiophones, lamellophones are tunable. Examples include the mbira and kalimba. Tuned percussion instruments like xylophones are sometimes included in this category. Friction instruments are any instrument that use friction to create sound, for example the glass harmonica or armonica, which Benjamin Franklin used. 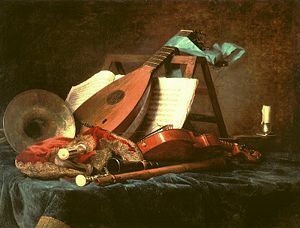 An ancient system, dating from at least the 1st century B.C.E., divides instruments into four main classification groups: instruments where the sound is produced by vibrating strings; instruments where the sound is produced by vibrating columns of air; percussion instruments made of wood or metal; and percussion instruments with skin heads, or drums. Victor-Charles Mahillon later adopted a system very similar to this. He was the curator of the musical instrument collection of the conservatoire in Brussels, and for the 1888 catalog of the collection divided instruments into four groups: string instruments, wind instruments, percussion instruments, and drums. Erich von Hornbostel and Curt Sachs later took up the ancient scheme and published an extensive new scheme for classification in Zeitschrift für Ethnologie in 1914. Their scheme is widely used today, and is most often known as the Hornbostel-Sachs system. Chordophones, such as the piano or cello, produce sound by vibrating strings; they are sorted into zithers, keyboard chordophones, lyres, harps, lutes, and bowed chordophones. Aerophones, such as the pipe organ or oboe, produce sound by vibrating columns of air; they are sorted into free aerophones, flutes, organs, reedpipes, and lip-vibrated aerophones. Idiophones, such as the xylophone and rattle, produce sound by vibrating themselves; they are sorted into concussion, percussion, shaken, scraped, split, and plucked idiophones. Membranophones, such as drums or kazoos, produce sound by a vibrating membrane; they are sorted into predrum membranophones, tubular drums, friction idiophones, kettledrums, friction drums, and mirlitons. Sachs later added a fifth category, electrophones, such as theremins, which produce sound by electronic means. Within each category are many subgroups. The system has been criticized and revised over the years, but remains widely used by ethnomusicologists and organologists. Andre Schaeffner, a curator at the Musée de l'Homme, disagreed with the Hornbostel-Sachs system and developed his own system in 1932. Schaeffner believed that the physical structure of a musical instrument, rather than its playing method, should determine its classification. His system divided instruments into two categories: Instruments with solid, vibrating bodies and instruments containing vibrating air. Some instruments fall into more than one category: for example, the cello may be considered either tenor or bass, depending on how its music fits into the ensemble, and the trombone may be alto, tenor, or bass and the French horn, bass, baritone, tenor, or alto, depending on which range it is played. Many instruments have their range as part of their name: soprano saxophone, tenor saxophone, baritone saxophone, baritone horn, alto flute, bass flute, alto recorder, bass guitar, etc. Additional adjectives describe instruments above the soprano range or below the bass, for example: sopranino saxophone, contrabass clarinet. When used in the name of an instrument, these terms are relative, describing the instrument's range in comparison to other instruments of its family and not in comparison to the human voice range or instruments of other families. For example, a bass flute's range is from C3 to F♯6, while a bass clarinet plays about one octave lower. Brown, Howard Mayer, and Curt Sachs. Grove Dictionary of Music and Musicians, Basingstoke: Grove, 2001. ISBN 9780333608005. Canadian Broadcasting Corporation. Archeologists discover ice age dwellers' flute. December 30, 2004. Retrieved February 19, 2009. Chase, Philip G., and April Nowell. "Taphonomy of a Suggested Middle Paleolithic Bone Flute from Slovenia." Current Anthropology. Aug–Oct, 1998, 39: (4) 549. De Schauensee, Maude. 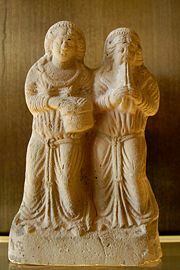 Two Lyres from Ur. University of Pennsylvania Museum of Archaeology and Anthropology, 2002. ISBN 092417188X. Kartomi, Margaret J. On Concepts and Classifications of Musical Instruments. University of Chicago Press, 1990. ISBN 0226425487. Marcuse, Sibyl. A Survey of Musical Instruments. Harper & Row, 1975. ISBN 0060127767. Moorey, P.R.S. "What Do We Know About the People Buried in the Royal Cemetery?" Expedition 20 (1): 24–40. Remnant, Mary. Musical Instruments: An Illustrated History from Antiquity to the Present. Batsford, 1989. ISBN 0713451696. Sachs, Curt. The History of Musical Instruments. W. W. Norton & Company, 1940. OCLC 547845. Slovenian Academy of Sciences. "Early Music." Science. 276 (5310): 203–205. This page was last modified on 16 December 2014, at 15:55.